My previous two posts have described how schools can improve access for students of color and students living in poverty to follow their passions and have more voice in choice in their learning. In the first post, I summarize an Education Week article by Dr. Kimberlee Everson who makes a strong case for schools to pursue these goals. In the second post, I laid out the first part of an action plan that school leaders can follow to address this opportunity gap between affluent, impoverished, and diverse schools. The headings I use to organize my thinking come from Appendix A of Regie Routman’s excellent resource Read, Write, Lead: Breakthrough Strategies for Schoolwide Literacy Success (ASCD, 2014). You may want to follow the embedded links in the previous paragraph to read this long-form piece of digital writing in a chronological order. Consider yourself warned: This is a longer post. I didn’t feel it necessary to extend this series any longer. I will put this content all together and make it available as a PDF download soon. Establish a schoolwide culture that promotes trust and risk taking. Just as we work harder for those teachers that care about and believe in us, learners will take more risks when the culture promotes it. Promoting risk-taking is beyond a leader simply stating “Try it out” to a teacher curious about exploring a new approach to teaching and learning. They have to know that the leader and their colleagues will be there for them when mistakes are made. And mistakes will be made! We’re not really risking much if challenges do not present themselves along the pathway toward becoming better. One decision I made this year to promote more risk taking as a school was replacing my formal observations of staff with informal instructional walks. Instead of scheduling a 1/3 of my staff for announced supervision times, I now pop into any classroom unannounced on a daily basis. We use the instructional walk approach suggested by Regie Routman from her book Read, Write, Lead. It’s a narrative- and strengths-based approach to staff supervision, instead of a check-the-box compliance task to ensure “fidelity” (whatever that is). In order to increase trust in the instructional walk process, I had our faculty participate in an article study in order to develop the tenets of student engagement. Teachers chose one of four articles to closely read from The Reading Teacher, glean specific concepts from the content, and then come together as a whole group to articulate the characteristics of engagement in the classroom. We posted our thinking on a Padlet (www.padlet.com) during the article study. These attributes of student engagement became the characteristics I would use as a lens when observing and experiencing classroom instruction. Once a trimester, I would count how I often I was observing each tenet of engagement and let the faculty know these results. If one characteristic was low, such as questioning, we would make a point of encouraging this practice to become more evident within instruction through the sharing of articles and content, and through professional learning activities. By stripping away formal observations and replacing them with instructional walks, we acknowledged that instruction is not simply a list of indicators to be documented and scored. Rather, teaching is a complex activity that is hard to understand and evaluate without an authentic and comprehensive view of what’s happening in the classroom. Allowing teachers to relax a bit about the evaluation process, they felt more comfortable in taking risks around increasing engagement through providing more access to opportunities. Mistakes were and still are seen as part of the teaching and learning process. Asking for teachers to become better practitioners demands that the leader be a part of the change process. Sometimes this involves becoming a teacher ourselves. For example, I hosted several technology training sessions for teachers to attend during the school year. They could post their questions via a Google Form about a topic or tool. These questions became our agenda for the evening. I also partnered with a classroom teacher who was exploring how facilitating conversations about reading might increase student engagement. We promoted books we enjoyed, taught students how to recommend titles to their peers, and gave them ample amounts of time to read and discuss their books with peers. I also facilitated some of the data collection by popping in once a month to check in on how students’ reading habits, thinking, and relationships with others might have changed due to becoming more engaged in reading. The results, still being compiled, are very informative. Assess whether we are learning more and getting better. This might be the most challenging part of engaging in a process of change that will allow students more opportunities to engage in meaningful and self-directed learning. A challenge, but not impossible. I collect examples of student work, such as performance tasks or their writing. I create a gallery of their work, stretching across a hallway for example, in developmental order such as by grade level/age. We briefly describe the purpose for the professional learning and expected outcomes (connect). Teachers discuss what they anticipate observing as a grade level or department (collaborate). Teachers reorganize into vertical/cross-departmental teams and do a “walk” together. They are asked to notice strengths and next steps in students’ work age by age and talk about these as a team (calibrate). Everyone comes back as a grade level or department to co-develop a new understanding about student work and why they believe what they believe now (consensus). As a whole faculty, teachers share their takeaways during a whole group debriefing (connect). 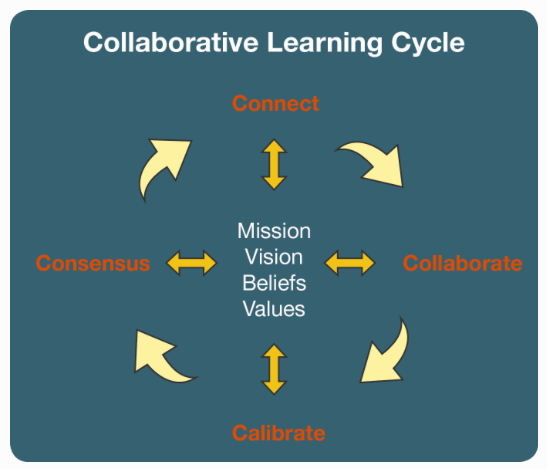 This is a cyclical process, which is really a nice model for what all learning looks like. Because we have done this yearly, I can share our debriefing notes to show how we have grown as a staff from year to year. Below are our debriefings from the last two years about student writing (last year is on the left, this year on the right). Notice any difference? We did. More of our students’ personalities were evident in their writing compared to last year. They were sharing about their personal lives in their writing more often, as well as connecting their reading to their writing. That led us to believe that choice and voice were more amply provided. These debriefings, when focused on our strengths first, become a celebration in a sense. We take pride in how our actions have directly contributed to the positive outcomes in our students’ work. Assess whether students are learning more. Money, staff, and resources might be tight, but one thing schools are not lacking is data. Seasonal screeners and interim reading measures can provide some information about a student’s growth over time. But if this is all that a school uses, we are outsourcing our abilities to accurately assess the learning that occurred within one school year. This year our school started using a student engagement survey to gain a better understanding of how they feel about learning and school in general. The results from our fall survey were so compelling, we actually changed our school’s goal to focus on specific practices that increase engagement, such as choice and student discussion, instead of curriculum integration. Another more authentic measure of student learning we have utilized for a couple years now are digital portfolios. Six times a year, teachers and students upload a learning artifact into FreshGrade (www.freshgrade.com). They also enter a reflection that documents what they did well, what they still need to work on, and their goal for the next time they have to upload an artifact to their digital portfolio. As a bonus, families have appreciated knowing how their students are progressing throughout the school year, instead of waiting for report cards and conferences. Students also feel more in control of their learning, as they are being asked to be the “chief assessors” of their work. The action plan I have described within the last two posts is one approach to bringing about change in a school with the goal of increasing engagement and providing access for all students to have more control over their learning and follow their interests. It is not to be followed step-by-step. What would be wise is to take what seems useful from our work and apply it as a school leadership team sees fit. I would recommend following the smart steps that Regie Routman lays out in her book, which I used to guide our school’s journey. As I reflect on the beginnings of this writing, I am a bit surprised to realize that I veered a bit off course in my initial purpose. Readers might be expecting that I would simply advocate for makerspaces and STEM labs as a solution to the lack of access students might experience to unique learning opportunities. Yet here we are, talking about reading and writing and how the connection between the two, when made evident for students, has increased student engagement. Maybe the journey led us to an unexpected destination. Don’t get me wrong. I like these trending topics. Makerspaces and STEM labs are in part a reaction to the suffocating grasp our policy makers have placed on our schools to meet standards and prescribed expectations in the name of accountability. It is interesting that Dr. Everson does not advocate for any one approach over another in providing access to more engaging and authentic learning experiences for students. Instead, she asks of our nation’s leaders to take a more thoughtful approach about teaching the whole child. It is my hope that they will advocate for rights of families that extend beyond access to buildings, a uniform curriculum, or high-test-score-producing teachers. It is my hope that they will feel teachers’ desire for freedom to inspire and children’s desire to explore the world with passion. With that, I hope that school leaders soon find their entry points into discovering what’s possible when we offer students the time, resources, and space to pursue their own interests and develop expertise in that area. This is a necessary part of learning. For us, I am already toying with a schedule that would allocate a 1/2 hour every day next year toward “Project Time”. This would be at the end of the day, where students had even more control over how they spend that time in school. It is not a solution to a problem, but that next step in giving the ownership of learning back to our students. This post has a lot of wonderful content, but what appealed to me most as a teacher was the fact that you pop into classrooms frequently. It shows teachers that you are interested in and value their work. It opens communication between teacher, leader and students, and is a great way for students to get to know the principal as a teacher and not just someone remote in the office. It allows the teacher to become comfortable with your being there and provides an opportunity to discuss what was happening knowing that it is a shared experience. Many years ago I worked with a principal who was constantly popping in. I loved the opportunity to show off what the children were doing and learning. He would join in with whatever was happening and discuss with the children what they were learning. It was a privilege to work with such a wonderful leader. In more recent years I worked with principals who never stepped out of their offices, and administrators who promised to visit but never did. Staff morale was low and none of us felt valued. The children had no idea about the principal as a person or in his official role. Congratulations to you for your initiative. I’m sure it is valued by teachers at your school. Thanks for commenting Norah. Yes, our teachers really appreciate my increase in visibility and providing more formative feedback instead of evaluating a snapshot of instruction. The students certainly appreciate it too. For me, I feel a lot more aware about the instructional pulse in the building. It gives me credibility when having conversations with parents and staff. Yes. There are many positives – for everyone!